Wouldn’t you love to know, with almost absolute certainty, where a specific wild food grows? I’m not talking about merely being able to recite a particular habitat characteristic of a specific plant or mushroom, but rather really knowing, before even setting out on your foraging adventure, where your organism of interest can be found. For example, reading in a field guide, you will learn that wild rice can generally be found in bodies of flowing water, such as rivers, streams, and shallow lakes that have an inlet and outlet. Morel mushrooms, you will read, are associated with old apple orchards and stands of tulip poplar, ash, beech, maple, and dead or dying elm trees. It’s one thing to verbalize this information. It’s another to truly know and understand where these habitats actually exist. In this post, I am going to present an easy and simplified guide to locating, identifying, and harvesting wild edibles, using wild cranberries as an example. Many blogs and field guides will lay out exact habitats for wild organisms, providing extremely detailed text-book descriptions. This is important information, and a great starting point. It is my intention to explain a bit further how I then use this information to go out and find, with certainty, the exact food for which I am looking. Use a field guide to learn habitat, defining features, physical description, and proper season of harvesting. As previously stated, a field guide is an excellent starting tool. How can you find anything without knowing exactly what it is you are looking for? While the question may appear to be a metaphysical one, it is certainly relevant to the topic at hand. The wild cranberry (Vaccinium macrocarpon) is a trailing evergreen shrub with leaves oblong-elliptic and entire (click on the image above to view details). Its habitat generally includes slightly acidic bogs, swamps, peaty wetlands and, occasionally, poorly drained meadows. The fruit hardly needs a description, as the cultivated cranberry, found inhabiting supermarkets across the country, appears quite the same. In the wild, the fruit is (no surprise) red, sour, and 10-20 millimeters in size, hanging from pedicels 2-3 centimeters long. The small cranberry (Vaccinium oxycoccos) presents slight physical differences, though it can be used and eaten in the same manner as the large wild cranberry. Both fruits ripen in the autumn months. It’s a simple question: Have you ever stumbled upon bogs, swamps, peaty wetlands, or poorly drained meadows? Think for a moment. It is likely that you have invested a good portion of your time exploring the wilderness, whether through foraging adventures, hiking, camping, mountain biking, climbing, or any other outdoor excursions. Can you ever remember a habitat resembling the one characteristic of wild cranberries? If so, go there when the time is right (supermarkets don’t count). If not, read on. 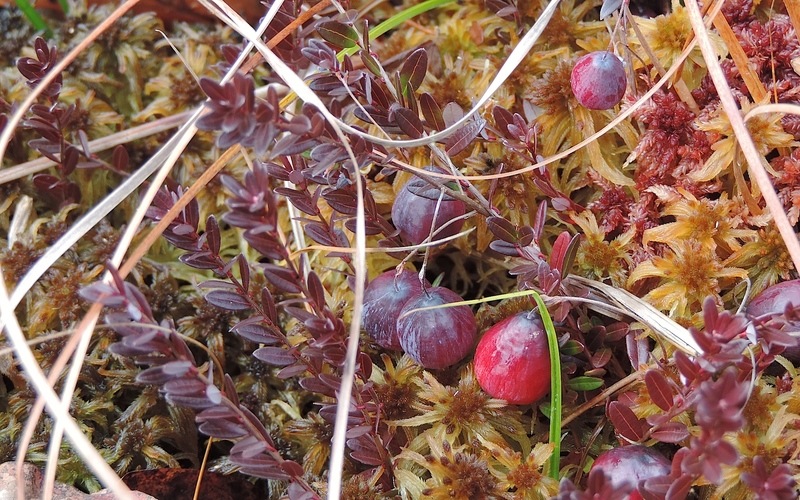 A typical cranberry habitat – bog, during the proper season of harvesting – autumn. Remember the old adage: “Ask, and you shall receive.” Truer words were never spoken. You can approach this step one of two ways: Ask others directly if they know where wild cranberries grow, or ask them if they’re aware of any bogs, swamps, or peaty wetlands in your general area. I find this step rather effective in fostering the success of my hunt, with the latter question yielding more results than the former (secret spots are hard to part with). Who to ask? Now, I understand that rules and regulations apply regarding the harvesting of wild plants and mushrooms in certain areas, and I’ll provide the usual disclaimer: know the guidelines in your targeted area. Having said that, contacting community and state parks and speaking to park staff officials can yield positive results. Emails, phone calls, and personal interactions (the latter being my go-to method) have all yielded success in my experiences when asking both questions (Do you know where wild cranberries grow? 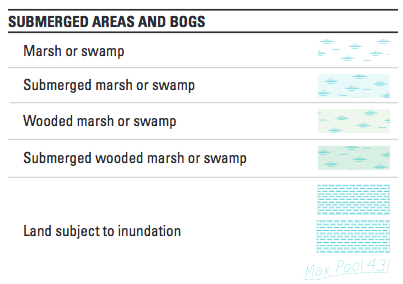 Do you know of any bogs in the area?). Other groups to survey include naturalists, local foragers, and those who frequent online foraging forums. And of course, naturalist-led walks, workshops, and events are excellent educational opportunities to learn your land firsthand, both through the learning experience itself, as well as through the ability to ask event leaders and participants the aforementioned questions. Type “(your state) wild cranberries” into your favorite search engine. 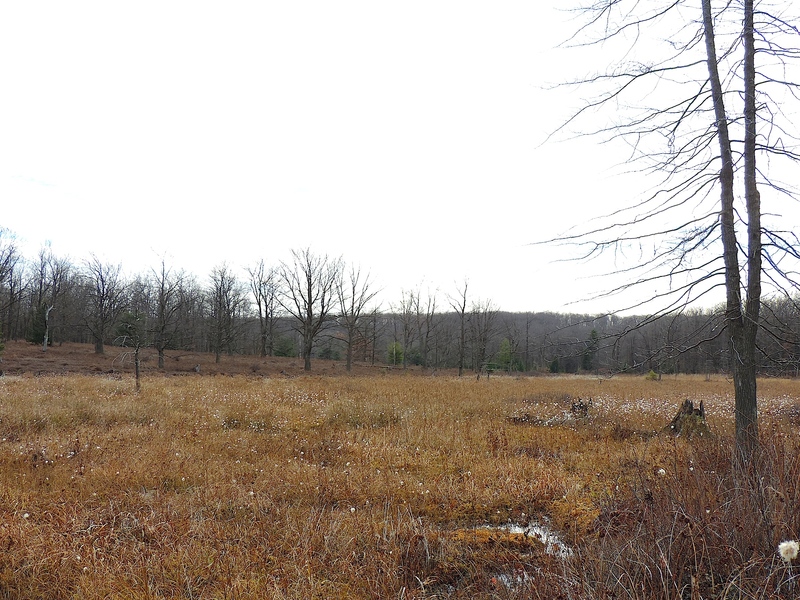 Additionally, search the wild cranberry habitat by typing “(your state) bog” into a search engine. Don’t limit your search to the first page of search results. Rather, keep digging deeper, through state park websites, research materials, personal blogs, and online forums. Chances are good that you will discover pertinent information leading to an area replete with wild cranberries. Thoreau surely wasn’t talking about a topographic map, as this particular tool contains a detailed and graphic representation of natural and cultural features, including water, relief, and vegetation. This resource is especially helpful in the search for wild cranberries. If you recall, cranberries typically inhabit bogs, swamps, and peaty wetlands. Lucky for us, this habitat is featured on a topographic map. If located within the general geographic location of wild cranberries (Pennsylvania, for sure; Oklahoma, not likely), this is most certainly an area where your coveted fruits may be found. Examine further the general area, seeing if there are more bogs nearby, if the land is public, and whether or not the land is accessible to humans (hiking in 20 miles for cranberries displays some serious dedication). With each adventure into the wilderness, take note of the habitats you encounter. Write down your experiences. Develop a catalog of ecosystems. When hiking a favorite trail, for instance, notice that habitats can morph and evolve every few miles, starting with a hemlock forest lining a river valley, moving upland into an area with hardwood trees, and eventually opening up into a peaty bog. Each habitat can be characterized by distinct species that live and thrive in these areas. As you begin your search for wild cranberries, perhaps you will recall this trail and explore its bog in more depth. Use every experience in nature to absorb the features of the land. When the time comes, any future search for a wild food will be met with less resistance, more ease, and more fun. The guidelines outlined above can be used not just for wild cranberries, but for any wild food. 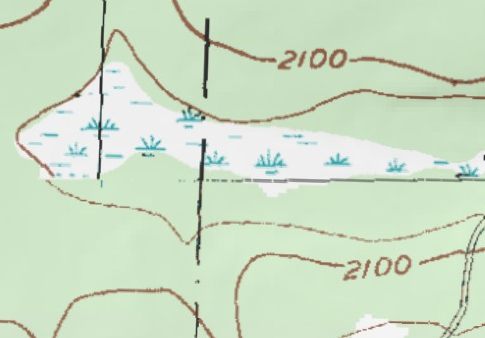 Looking back to our wild rice example, for instance, we can use a topographic map to locate a lake that contains an inlet and an outlet in our general area. For morel mushrooms, we can join a local mushroom club, attend its walks, and ask the trusted identifiers for help in locating old apple orchards, tulip poplars, and dead or dying elm trees (good luck asking them about their favorite spots though). Now, I understand that not every wild food will be located with absolute ease 100% of the time. And no single step listed above will work at the exclusion of the others. However, if you do go through this list and apply the information as best you can, I have confidence that you can refine and vastly improve your skills in locating, identifying, and harvesting your wild food of choice. Oh yes, one more thing. I’d love for you to check out this recent video I created regarding … you guessed it … wild cranberries! how do i know there’s cranberries in my area? do they require certain conditions?